Aim: Several diseases continue to affect strongly the populations’ health in Africa. Meanwhile Ethnopharmacology, a scientific interdisciplinary study of natural substances and related knowledge’s or practices that cultural groups implement for therapeutic, curative, preventive or diagnostic purposes, must be developed in the continent. Therefore sustainable development, a conception of common well being developed since the end of the 20th century can be effective by developing in Africa low-priced phytodrugs for consumption and exportation. The objectives of this study were to sustainably collect and document important cultural heritage before it is lost and to investigate and evaluate agents used to promote drug discovery in Cameroon. Materials and methods: To achieve these objectives we have used a methodology that begun by a field work, that started by harvesting and identifying plant species with confirmation in National Herbarium and the Ethnopharmacological detailed preparation of recipes and ended by the research of previous studies on recorded plants. Results: Forty-three (43%) of recorded plants is been documented for the treatment of diseases and investigated for their phytochemical and activities confirming of the rationalization of their traditional uses. Some plants are documented for the first time for their medical use, for example Massularia acuminata for hypertension, Pentaclethra macropylla for infectious diseases, Hallea stipulosa for difficult deliverance, Guibourtia tessmannii for diabetes, Piliostigma rufescens for dysentery, Carica papaya for cancer and Solanum torvum for gastric pains. Conclusion: The results of E-ISSN: 2320-1215 P-ISSN: 2322-0112 RRJPPS | Volume 5 | Issue 3 | September, 2016 40 this study stimulate a sustainable development by providing the basis for low cost drugs discovery and by documenting biodiversity for long time exploitation. Ethnopharmacology is scientific interdisciplinary study of a set of vegetal, animal or mineral materials and related knowledge’s or practices that, socio cultural groups implement for modify the states of living organisms, for therapeutic, curative, preventive or diagnostic purposes. For instance several plants used generally in Africa and particularly in Cameroon have been studied in Botany, chemistry and pharmacology . Searches of new active ingredients by pharmaceutical laboratories and universities have permit to confirm certain traditional uses. During the open ceremonies of Harare forum in 2000 Doctor Ebrahim M. Samba, regional Director of WHO for Africa, has declared: «It must give to traditional medicine the respect and the place that it merits». He declares that WHO was ready to bring it assistance to protect intellectual property related to indigenous knowledge on traditional medicine and to facilitate the creation of botanical gardens intended for the cultivation and the preservation of local medicinal plants. For Doctor Samba WHO is disposed to supply a technical help for the drugs discovery from medicinal plants and to insure the production for local consummation and exportation, in the respect of good practices of manufacture. Despite the absence of legal management, necessary for the development of searches and production of phytodrugs in Africa, we assist to the creation and the production of African simple specialties from some plants used traditionally and susceptible to replace in certain cases imported medicines. Cameroonian floral has about ten thousand species of plants . Yet, less than hundred and twenty medicinal plants are recorded . Synthetic drugs cannot always duplicate the curative properties of natural drugs. Today major number of pharmaceutical firms and medical research institutions are returning to their roots in the plant world. The objective of this study was to collect and document information on herbal remedies traditionally used for the treatment of diseases and susceptible to promote drug discovery in Cameroon. It was begun by a field work, divided into parts: The collect and identification of plant samples with confirmation in National herbarium and the Ethnopharmacological detailed preparation of recipes including the weight of plant parts and volume of solvent used, the plant(s) or nonplant(s) associated, the modes of preparation including decoction, maceration, infusion, triturating, inhalation, scarification, washing, purge, ointment, etc, posology, duration of preparation, mode of administration and duration of treatment. The process used to collect information has begun by a field work based on harvest and identification of plants of interest. During this step Ethnopharmacological detailed preparation of recipes were described with the aim of informants. This description focused on the mode and the time of preparation, the mode of administration, the posology, the duration of treatment, the undesirable or secondary effects, the toxic effects and the disease treated. It was followed by the chemical and pharmacological approach based on investigation of previous searches. Hence chemistry and pharmacology have also played a great role in the evaluation of natural products . Confirmation of botanical identification was done in National Herbarium of Cameroon and voucher specimens are deposited in the Institute of Medical Researches and Medicinal Plants Studies. Data were collected from 91 respondents drawn from 28 tribes using some validated questionnaires. The distribution of the respondents includes 41 traditional healers and 50 other resource persons. All the recipes were presented following diseases of different human apparatus including cardio-vascular, digestive, respiratory, nervous, female genital, male genital and urinary; bone-muscle-joints, Nose-mouth-throat-ear, eyes, skin and pediatric pathologies, symptoms and particular syndromes like anorexia; diseases and particular indications like alcoholism [5,6]. All diseases, modes of recipes’ preparation, routes of administration and durations of treatment are presented in Table 1. 1.Total, 145 recipes from 144 plants belonging to 120 genera and 68 families, were used for 113 diseases. Some plants are important by appearing in more than two recipes for the treatment of more than two diseases. They include Harunganamadagascariensis for the treatment of pelvic pains, gynecologic infections, hepatitis, jaundice and malaria, Acanthospermumhispidus for colic, dysentery, headaches and loa-loa, Tetrorchidiumdidymostemon for pelvic pains, congestion of lungs and prevention of neonatal infant death, Croton haumanianus for pains before the heart, urogenital infestions and hypotension, Anchomanesdifformis for constipation, epigastralgia and tuperculosis, Alchorneacordifolia for dental algia and hemorrhoid, Piper umbellatum for the treatment of pains before the heart and tabagism and Pausinystaliayohimbe for frigidity and sexual asthenia. Table 1. Description of recipes following logical regroupings of diseases. Thirteen polyspecific recipes were prepared by combining 2-5 plants. Hence AmaranthushybridusandOcimum gratissimumareassociatedto treat epistaxis;Irvingiagrandifloraand Staudtiastipitata are used to treat polymenorrhea; Tetrachidiumdidymostemon associated to Kalanchoecrenataand Cissusaralioidestreat repeated abortions, spontaneous abortions and stillborns; Ocimumgratissimum,Sennaoccidentalis ,Arachjs hypogea, Musa paradisiaca and Monodoramyristicatogether treat fracture; Erigeron floribundus,Emilia occinea and Bidenspilosaareused to control paralysis; Calancobawelwitshii, Barteriafistulosa and Sarcocephaluslatifoliusrelease myosite or musclepains; Amaranthusviridus, Kalanchoecrenataand Asystasiagangeticatreat nevrosity,AlchorneacordifoliaandErigeron floribundusare used againstdental algia or teedache;TamarindusindicaandManihotesculenta treat chickenpox; Diodiascandensand Mitracarpusscabertreat ringworm;Tetrorchidiumdidymostemon and Bryophylumpinnataare usedin the prevention of Neonatal infantile death; Cogniauxiapodolaena, Sennacccidentalis, Piper umbellatum, Costusafer ‘and Crinum natan are used to stop alchoolismand tabagism. At last Cocciniagrandis, Pistiastratiotesand Palisotahirsuta are combined to control snack bite. The distribution of ethnopharmacological modes of recipes’ preparation, natural resources’ parts used distribution of administration routes of recipes and distribution of durations of treatments are presented in Figures 1-4. Figure 1. 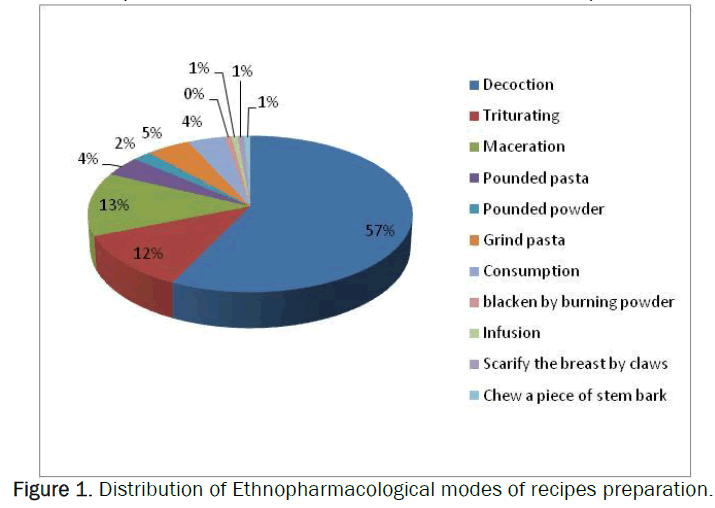 Distribution of Ethnopharmacological modes of recipes preparation. Figure 2. 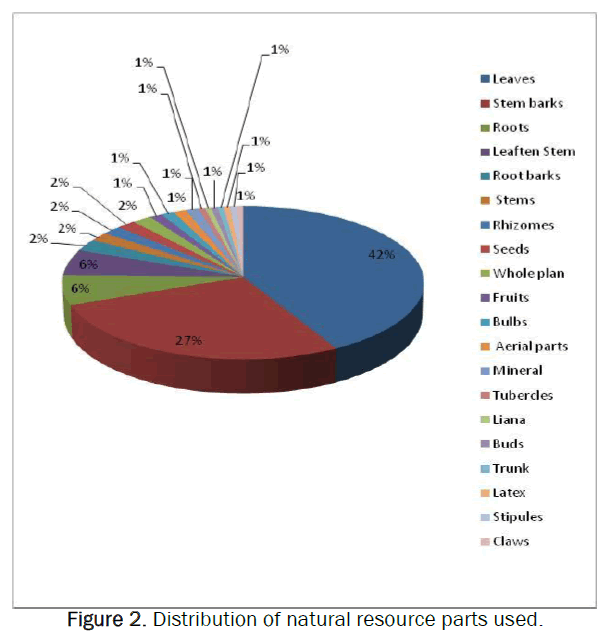 Distribution of natural resource parts used. Figure 3. Distribution of administration routes of recipes. Figure 4. Distribution of durations of treatments. The Figure 1 shows that the decoction (57%) is the main mode of ethnopharmacological preparation of recipes, following by maceration (13%) and triturating (12%). The Figure 2 reveals that the leaves (42%) and the stem barks (27%) are the important plant parts used; following by roots (6%) and leaften stems (6%). The Figure 3 shows that oral route (70%) is widely used. It is followed by inhalation (9%), Ointment (8%) and washstand (6%). 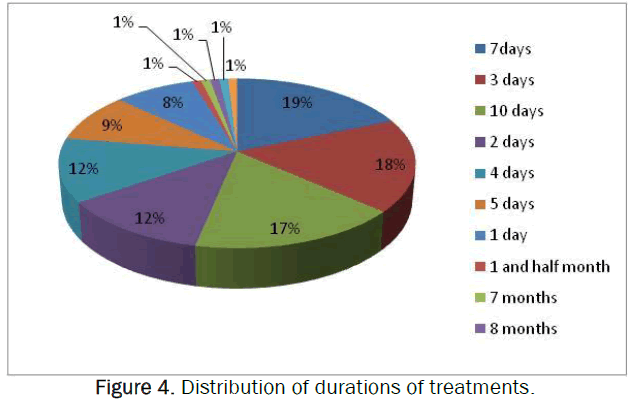 The Figure 4 reveals that the most important duration of treatment are 7 days (19%), 3 days (18%) and 10 days (17%), following by 2 days (12%) and 4 days (12%). The most long treatment durations are 7-8 months for repeated abortions, hepatitis, threat of abortion and stillborn. Some recorded plants (43%)are investigated for their phytochemical and pharmacological properties confirming of the rationalization of their traditional uses. For examples Pausinystaliayohimbe stem bark contains yohimbine: an aphrodisiac alkaloid; Catharanthusroseusdry root constitutes a source ofajmalicine, a hypotensive of spasmolytic alpha blocker groups that is adrenolytic and increases cerebral blood flux up to 30% of carotidal rate of flow. It ensures a better irrigation of the brain and presents a slight anxiolytic and anticonvulsive activity. Acanthospermumhispidus presents antibacterial, antiproliferativeand immunomodulatric activities, antiplasmodial, antitrypanosomial and Leishmanicidal activity in vitro. But the plant presents a renal, hepatic and spleen toxicity after symptoms manifested by diarrhea, dyspnea and alopecia; Allium sativum presents antibacterial, antiviral, antifungal and anthelmintic properties. Piper umbellatum leaf warmed and placed on the affected area is used for body pain in Venezuela .Analgesic and antiinflammatory activity has been shown for the water and water–ethanolic extract of this plant. The vasorelaxant effects of Perseaamerica leaf extract appeared to contribute significantly to the hypotensive (antihypertensive) effects. However, this activity tends to suggest that P.americana leaf could be used as a natural supplementary remedy in the management, control and/or treatment of essential hypertension and certain cardiac disorders in some rural Africa communities. Tetrorchidiumdidymostemon and the association of Sarcocephaluslatifolius, Citrus auranthifolia and Allium sativum are documented for the first time for their medicinal uses. Some nontoxic recorded species are transformed into low-cost phytodrugs by private small laboratories or pharmacists(Figures 5-7).They can contribute to the improvement of people’ heath and reduce importation. Figures 5-7. Existing phytodrugs officially authorized in Africa from recorded plants including respectively Emilia coccinea, Dissotis rotundifolia and Pausinystalia yohimbe . The results of this study stimulate a sustainable development by providing the basis for drugs discovery and by documenting biodiversity for long time exploitation. At the end of this study 113 diseases were treated by 144 plant species. Some of them have been documented for the treatment of diverse diseases. Certain active ingredients have been isolated from some of these plants and confirm their traditional use. However, several other medicinal plants need to be recorded in Cameroon. Therefore investigations must be carried out to record manifold medicinal plants and some other uses. The authors are thankful to traditional healers and all informants who share their knowledge with us. Pousset JL. Politiques nationales: Place des médicamentstraditionnels en Afrique. Med Trop, 2006;66:606-609. LetouzeyR. Etude phytogéographique du Cameroun. Editions Lechevalier Paris. 1968;511. Adjanohoun EJ and Ahyi AMR. Médecinetraditionnelleetpharmacopée. Contribution aux étudesethnobotaniquesetfloristiques au Congo. ACCT, Paris 1986;587. Roersch CM. Piper. umbellatum L.: A comparative crosscultural analysis of its medicinal uses and an ethnopharmacological evaluation.J Ethnopharmacol. 2010;131:522–537. Ojewole J, et al. Cardiovascular effects of Persea Americana Mill (Lauraceae) (avocado) aqueous leaf extract in experimental animals. Cardiovasc J Afr. 1998;18:2:69-76.